Parker Hannifin demonstrated its latest products and system solutions that help drive increased productivity and profitability in the oil and gas industry at this year’s ADIPEC. With many decades of experience and materials science expertise, Parker’s solutions are optimised for the corrosive environments and harsh conditions typical of applications within the sector. Parker’s close to one million innovative, safe, strong and lightweight products solve engineering challenges in key focus areas such as filtration and instrumentation for upstream, midstream and downstream stages in the sector. The company and its unrivalled, knowledgeable distribution network partners with OEMs, engineering procurement companies (EPCs) and distributors. This ensures the optimisation of designs and product selection and supply for efficiency, reliability and asset integrity that helps maximise productivity and minimise costly and sometimes safety compromising downtime. 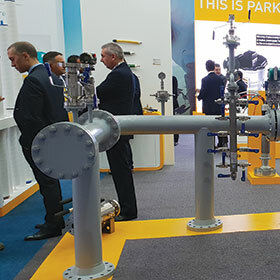 Amongst the many exhibits featured at ADIPEC were Parker’s autoclave products that included needle and ball valves, pipe fittings and liquid pumps for low, medium and high pressures (up to 1100 bar). Also included was the A Lok fittings range that underlines the company’s expertise in anti-corrosion solutions for oil and gas. Cost reduction and low maintenance optimisation was exampled by products like the CDAS and OFAS units that provide clean, dry and oil-free compressed air to the most stringent industry standards.